I believe first and foremost in supporting and developing what musically inspires a student’s decision to study and play music. Andy is an accomplished jazz, classical, rock, r&b, etc. musician. He performs regularly with several groups around the DFW area. He has also performed and recorded with artists from the Nashville, Miami and Washington D.C. areas. Andy has arranged an original composition by world renowned jazz artist, Kurt Rosenwinkel, which was performed by Kurt himself along with the, Grammy award winning, University of North Texas’s One O’clock lab band in Spring of 2010. 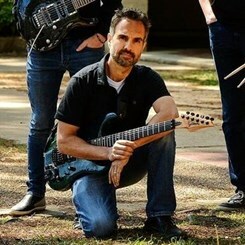 He has written and produced the theme music for an up and coming television show as well as scoring for a documentary film (http://www.dont-tell.my/wife/ look under buy and download theme song). "I believe first and foremost in supporting and developing what musically inspires a student’s decision to study and/or play music. In order to fully develop control, musicality and understanding of the music language, it is important to focus on several aspects of music including music theory (scale and harmonic structure/function and rhythm) ear-training, reading and performance skills." "Like any aspect of life, consistency and patience are two very important qualities to posses when working towards a goal. The duration of each practice session is proportional to the level of the student. Learning how to practice efficiently with your instrument is key for adherence and success in obtaining your goals." Andy also strongly believes that service to humanity is of the utmost importance. He has performed for and been a part of many worthwhile causes such as the Dallas Life Foundation, Juvenile Diabetes, Food For Hunger Organizations, Medi Send, as well as Habitat for Humanity and fundraising for the Baha'i Faith.